Juicy and hearty flavored as our grain-fed beef, Steaks Burgers will make you wonder why you ever thought supermarket burgers were good. Serve a platter of them hot off the grill with a mountain of hearty skins-on steakhouse fries. Then follow them up with yummy Caramel Apple Tartlets to thrill your hungry party crowd. Meal serves 4 - 8. Grill or Broil: Thaw burgers. Grill or broil for 5-6 minutes per side until internal temperature reads 160�F. Overcooking can result in a dry product. Contact Grill: Grill for a total of 5-6 minutes until internal temperature reaches 160�F. It's easiest to remove burgers from the wrap while still frozen! Pan Fry: Preheat a small amount of cooking oil in non-stick pan over medium heat. 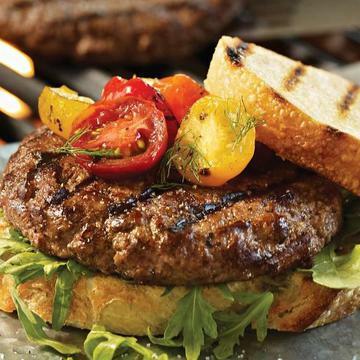 Add burgers, pan frying for 6-8 minutes on each side or until internal temperature reaches 160�F. Do Not Thaw! Oven: Preheat oven to 450�F. Remove fries from packaging and place on a baking sheet with lined parchment paper or foil lightly brushed with oil, leaving space in between. Place sheet in oven on center rack. Bake for 18-20 minutes. Grill: Preheat grill to medium. Remove Omaha Steakhouse Fries from plastic packaging and place on a perforated grilling pan. Heat over grill for 15-20 minutes, stirring constantly. Ingredients: Apples, Enriched Bleached Pastry Flour (Wheat Flour, Thiamine Mononitrate, Riboflavin, Niacin, Iron, Folic Acid), Non-Hydrogenated Vegetable Shortening (Modified Palm and/or Palm Oil), White Cane Sugar, Enriched Bleached All Purpose Flour (Wheat Flour, Thiamine Mononitrate, Niacin, Riboflavin, Iron, Folic Acid, Amylase), Water, Corn Syrup, Cream, Lemon Juice From Concentrate, Modified Corn Starch, Salted Butter, Liquid Whole Eggs, Glaze (Sugar, Agar, Refiners Molasses), Salt, White Vinegar, Yeast, Enzymes, Cinnamon, Modified Tapioca Starch, Molasses, Natural Flavors, Dextrose, Soy Lecithin. Allergens: Wheat, Eggs, Milk and Soybean. Manufactured in a plant that produces nut products.